With the ever-increasing market need for a comfortable, efficient and economical way to pick cases up to 25 feet, Toyota expands its Order Picker forklift line-up with the 7BPUE15 model. Separately Excited (SepEx®) drive motor and transistor control technology combined with an ergonomic design deliver a cost-effective solution for the customer's Order Picking needs. Spacious Operator Compartment with 7 3/4" low platform height eases frequent entry and exit during the work shift for reduced body fatigue. Bubble-Cushioned Floor Mat is designed to reduce the effects of vibration and standing stresses to limit body fatigue. Low-Effort Flush-Mounted Brake Pedal allows increased freedom of movement for greater operator comfort. 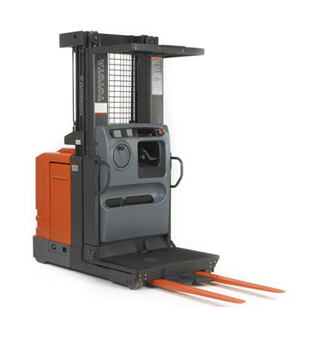 Anti-Rattle Mast Staging with cushioned mast stops provide smooth lifting and lowering for confident load handling. Clipboard and Work Material Storage Areas provide a convenient, easy-to-rich, mobile workstation for added operator convenience. Traction system delivers precise speed and torque control loaded or unloaded. DC Hydraulic Control System provides fully variable lift/lower control for fast, efficient and smooth operation. Multifunction Control Handle allows single-handed control of travel, lift, lower and horn. Power-Up and Run Diagnostics speed up troubleshooting by checking and monitoring critical functions in order to maximize uptime. Power Unit Tractor Cover is easily removed to provide access to major components, reducing service time during inspection and maintenance. Fewer Components lead to simpler troubleshooting, resulting in reduced down-time and operating costs. Electrical and Hydraulic Components have been logically seperated to prevent contamination of electrical parts from hydraulic parts for reduced maintenance costs. Lift-Out Battery Gate and Corrosion Resistant Rollers allow easy battery removal from both sides of the unit for faster replacement and service. UL-E Approved to meet specific environmental conditions. Regenerative Braking improves overall efficiency while extending motor brush and component life. Solid State Limit Switches provide improved reliability and increased component life. Mast Tie-Beam has been designed to provide maximum torsional rigidity and stability for improved operator confidence at elevated heights. Electronic Disc Brake provides efficient braking power when the pedal is released.